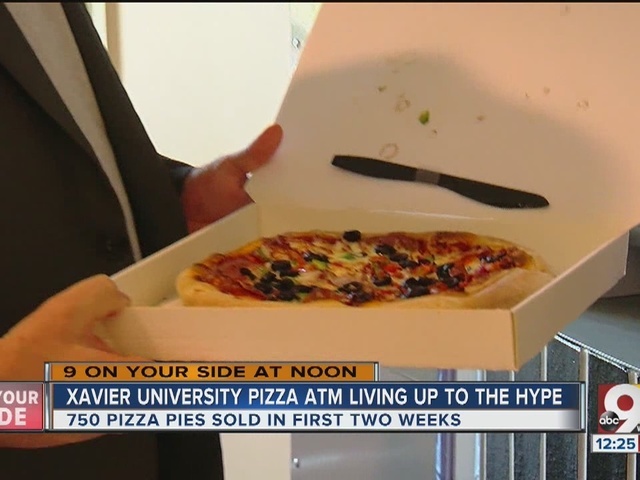 EXCLUSIVE: Xavier University's Pizza ATM is up and running. The early reviews? CINCINNATI -- The early verdict on Xavier University 's Pizza ATM, possibly France's greatest gift to America since the Statue of Liberty, is in. "It was better than I thought it would be," Xavier University freshman John Schoepf said Thursday. "It's not quite LaRosa's, but it's not down there at Little Caesars level." 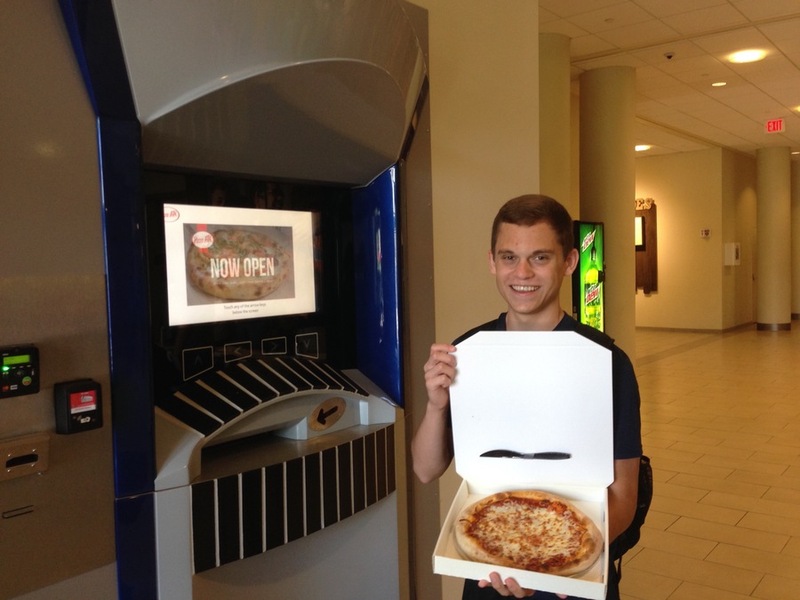 John Schoepf, a Xavier freshman, shows off the second pizza he's purchased so far from the new Pizza ATM. Photo by Bob Driehaus | WCPO. After the hype that swept the continent since WCPO broke the news that XU would host North America's first Pizza ATM , customers could be forgiven if they were expecting a cure for cancer in the sauce. "I thought the water they used to make the dough was made from angels' tears. Is that not true either?" asked a not-actually incredulous Robert Sparks, a XU web developer who usually goes only by the name Sparks. He liked the pizza despite its mortal nature. "It was actually really, really good. If you blindfolded me I wouldn’t know that it came out of a machine. Good crust, and it wasn't soggy," the Philadelphia native said. About that hype: Since WCPO published its story on Aug. 4, 3,000 newspapers, cable networks, national news magazines and other media outlets have followed, according to Jennifer Paiotti, marketing director of XU's auxiliary services. 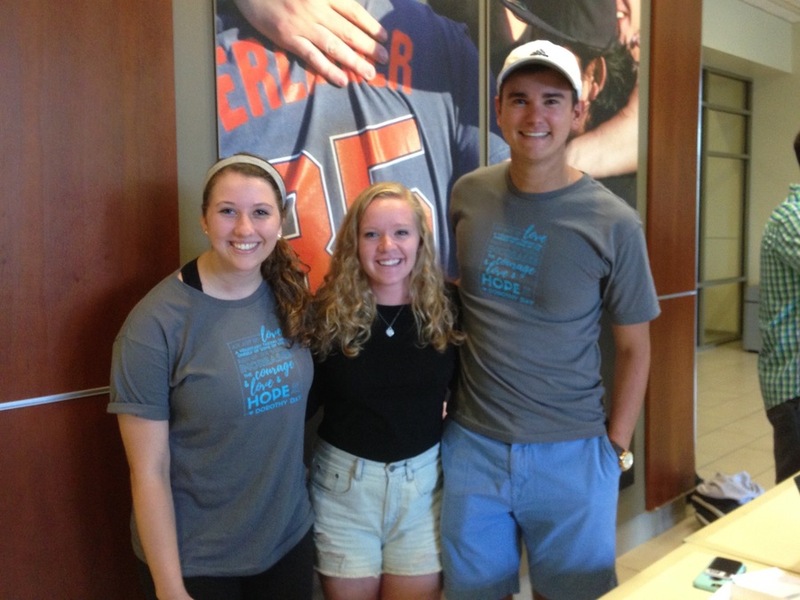 By lunchtime on Aug. 4, local competitors had followed with their own stories. By the weekend, incoming junior Emily Bishop saw a story on the local TV news -- in Fairbanks, Alaska. Paiotti hit the road the day after the news broke. In hindsight, bad move. "(The next morning), I was on the phone in Peoria, Illinois, talking with the New York Daily News," she said. A video about the Pizza ATM has more than 17.5 million hits on the manufacturer's website and is now on YouTube . A couple drove from Columbus to taste it. The machine has taken on a life of its own. Judging by the sales since the Pizza ATM became fully operational on Aug. 26, it's a hit. "We've sold 750 pizzas since then," Paiotti said. So far, the Vatican has not been called to investigate any miracles, but customers are leaving satisfied. "It definitely wasn't the worst, and it definitely wasn’t the best," said Greg McMullen, an XU web developer who normally packs his lunch. He tried a pepperoni pizza Thursday for lunch out of curiosity. "It was a good pizza. It was something I would get again if I had forgotten my lunch," he said. A trio of sophomores expressed more enthusiasm. "When the cafeteria is closed, it's just perfect," Tom Heisterkamp said. Kaitlin Mullahey and Megan Stewart shared one Wednesday night, and they plan to indulge regularly since they live in the residence hall above the ATM. "It's totally dangerous," Stewart said with a laugh. For those who haven't scarfed down the 3,000 stories about the Pizza ATM, Xavier partnered with France-based Paline to bring the technology to America. The machines have been up and thriving in Europe for 14 years, serving quiet towns after restaurants are closed and gracing gas stations. • The machine moves the pizza to a disc, juke-box style, into the convection oven that's fired up to about 425 degrees. When it's done, the pizza is placed in a cardboard box, which ejects through a slot. Xavier's is installed in the lobby of Fenwick Place just outside XU's Hoff Dining Hall and can be stocked with 70 pizzas at a time. Along with its ability to bake the pizza, the Pizza ATM distinguishes itself from vending machine pizza with high quality. Paline sent a French chef to Xavier to train five chefs for 40 hours each on how to make a great pizza. They learned how to take factors like room temperature and humidity into account, and they learned new respect for the dough. Xavier has an exclusive contract with Paline, which means those who want to buy their own Pizza ATM anywhere in the United States will have to come to pizza training school at Xavier. Ed Devoid, director of residential dining, said his staff used to make dough for the dining hall by hand and use it the same day. Now, they knead and let it rise twice over two days. Last year, XU sold about 125 pizzas a day in the dining hall. In the first weeks of the new school year, they're selling 200 a day since the French chef set them straight. Xavier flipped the switch on the Pizza ATM as quietly as it could after all the hype in order to work out any glitches before its official coming-out party. The credit card readers and smart phone scanners haven't worked perfectly, but Paiotti hopes to have all the bugs out of the system in time for the grand opening on Sept. 8. The grand opening theme? "Coming to America." Paline executives are flying in from France to cut the ribbon, and people dressed as the Statue of Liberty and Uncle Sam are also on the guest list.